The layout of the main window can be customized however you'd like. 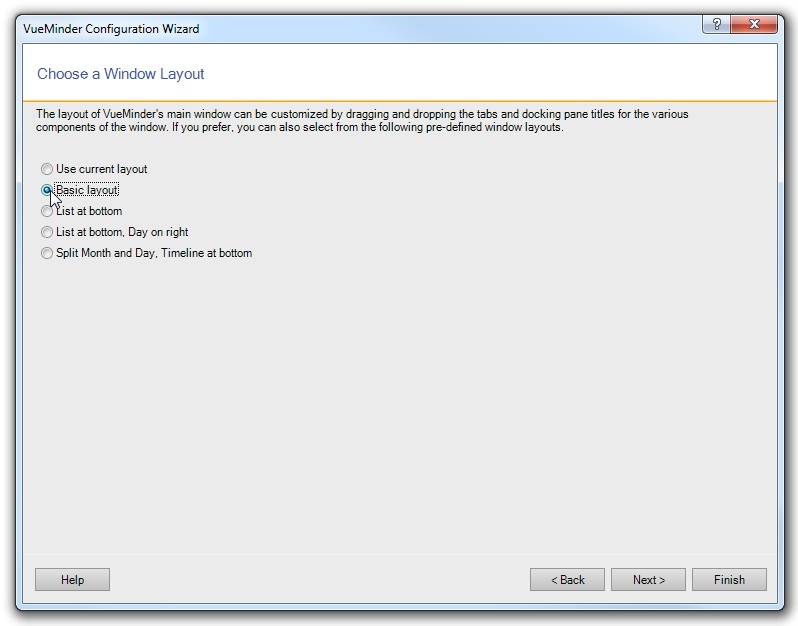 To help get you started, several pre-generated window layouts are provided by the Configuration Wizard. To preview a layout, click its radio button. The main window will update to show the selected layout. After closing the Configuration Wizard, you can make additional layout changes to the main window or Calendar View, to better suit your needs. Custom window layouts can be saved or loaded via the Window menu. Basic Layout - All dockable panes are on the left side of the main window. All Calendar View tabs are combined into a single group. List at Bottom - The List View is shown in a separate tab group at the bottom of the Calendar View. List at Bottom and Day on Right - Both the List View and Day View are in separate tab groups, with the List View at the bottom of the Calendar View and the Day View on the right. Split Month and Day With Timeline at Bottom - The Month View and Day View are split to be roughly the same size in the Calendar View, on the left and right. The List View and Timeline View are grouped at the bottom.